Hey friends! 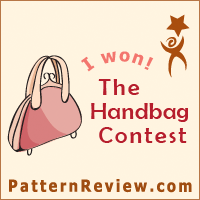 Guess who won second place in the Pattern Review Handbag Contest?? Thank you SO MUCH for helping me out with your votes. I am very grateful and very happy! And I’m loving my new bag. Previous Previous post: Forget Hillary. Forget Asshat. Vote for This Instead. Next Next post: Do You Sew Gifts?